Happy Wednesday! 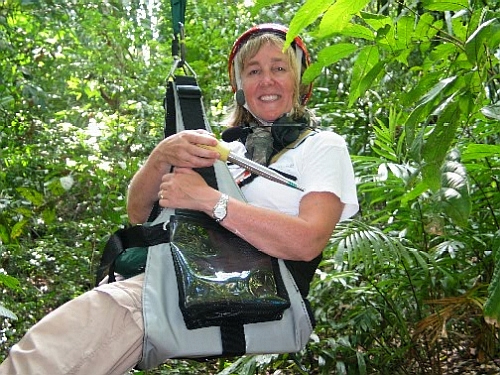 This week, we’re taking a closer look at the woman they call “Canopy Meg” – Dr. Margaret Lowman. Nicknamed the “real-life Lorax” by National Geographic and “Einstein of the treetops” by Wall Street Journal, Meg Lowman pioneered the science of canopy ecology. 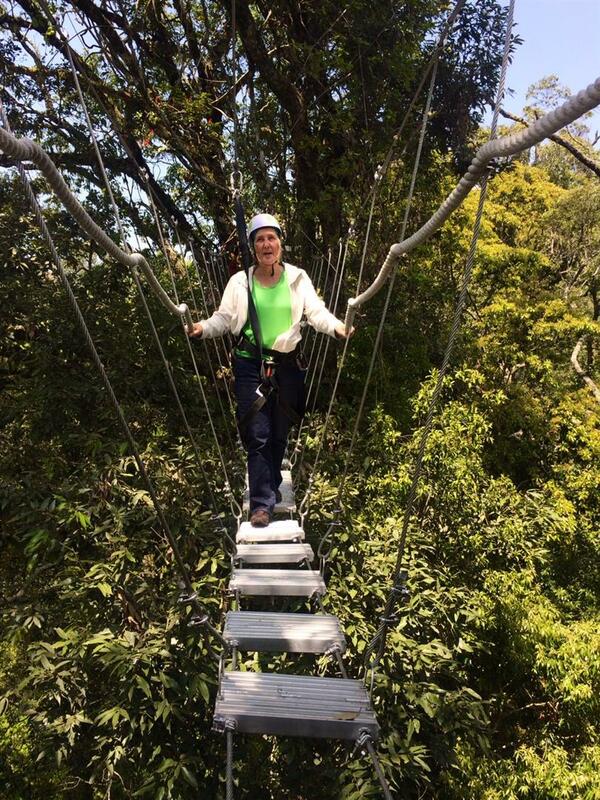 For over 30 years, she has designed hot-air balloons and walkways for treetop exploration to solve mysteries in the world’s forests, especially insect pests and ecosystem health. 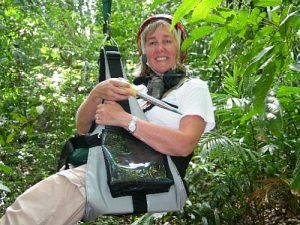 Meg is affectionately called the mother of canopy research as one of the first scientists to explore this eighth continent. 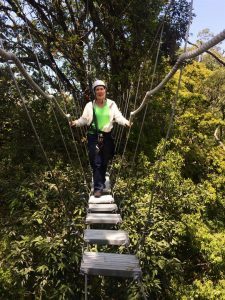 She relentlessly works to map the canopy for biodiversity and to champion forest conservation around the world, gaining her start in the rain forests of Australia. Her international network and passion for science have led her into leadership roles where she seeks best practices to solve environmental challenges and serves as a role model to women and minorities in science. Forests are like gigantic stands of lollipops. Since plant sugars are manufactured high overhead, organisms that depend on those sugars, such as insects and birds, are also far from the ground. Until recently, we did not know much about life in the treetops of the world’s forest because their canopies were difficult to reach. Now, thanks to ‘Canopy Meg’s innovations, scientists can climb safely into the “high frontier” to discover some of its wonders. 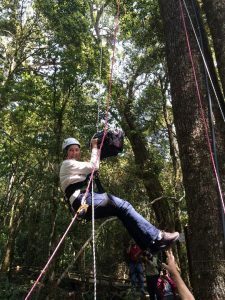 Dr. Lowman has developed an expertise for using different canopy access techniques such as slingshot fired ropes, hot air balloons with sleds, canopy cranes, and canopy walkways. Dr. Lowman believes in conservation through education which is a very strong theme in her most recent book It’s a Jungle Up There. She has been involved in several JASON Project education programs and numerous other conservation education initiatives. Her books on canopy ecology are not just about her field work but add dimensions in what it’s like to be a woman in a male dominated profession, and what it’s like to be a single parent mom. Her sons co-authored It’s a Jungle Up There and added their insights on how their mother’s career and their family not only survived, but thrived. A leading science innovator, Meg was the founding director of North Carolina’s innovative Nature Research Center at the North Carolina Museum of Natural Sciences, Meg oversaw the creation, construction, staffing, and programming of this research wing in partnership with the North Carolina University system. She was subsequently hired by the California Academy of Sciences to lead their twenty-first century strategy of integrating research with sustainability initiatives both local and global. Let us know if you’d like to bring Dr. Meg Lowman to speak to your organization, campus, or conference!